Fig. 1. Using a hand-held lightbar. 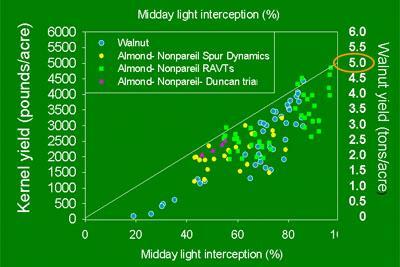 Canopy development in walnut and almond can be calculated, based on measurements of canopy light interception and the age of trees. This information, correlated with yield, is useful in yield studies that aim to quantify the impact of various treatments and management practices. Understanding and quantifying the impact of variation in canopy development will allow much more robust data interpretation. Fig. 2. Midday light interception related to yield. Canopy light interception is measured as midday canopy photosynthetically active radiation (PAR). Data based on PAR collected over the past several years has provided an estimation of productivity in walnut and almond. Production potential is about 0.05 tons/acre for walnut or 50 kernel lbs/acre of almond for every 1% of incoming light intercepted. In the graph (Fig. 2) the diagonal line indicates the maximum potential yield. Any number of factors can decrease orchard yield relative to it’s potential including water stress, disease pressure, poor bloom weather, and poor nutrient management. In these studies, a handheld lightbar was used in measuring PAR, a relatively slow and labor intensive method. For this reason, much of the lightbar data that was used to develop the relationship between PAR and yield was based on sampling of a relatively small samples of trees. At this site, PAR was measured in almonds under two irrigation management regimes. Predicted yield, based on PAR measurement, Actual yield and PAR values are presented. 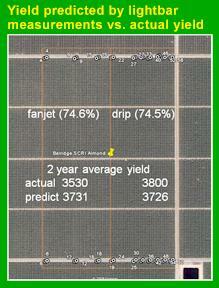 Average interception = 74.6% in fanjet and 74.5% in drip (see figure, right). This equates to estimated yields of 3731 and 3726 kernel pounds per acre versus actual yield. Maximum potential productivity is limited by the percentage of the total incoming PAR that a canopy can intercept. Fig. 3. 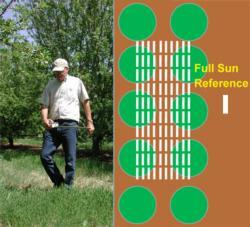 Comparisons under two irrigation regimes.